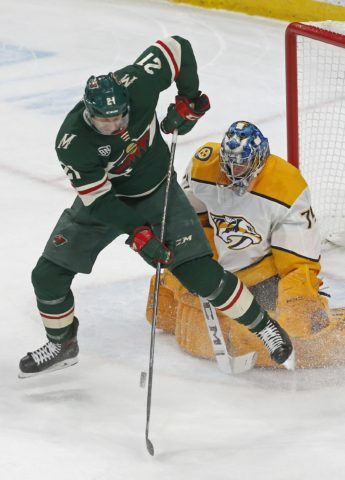 ST. PAUL, Minn. — Juuse Saros made 29 saves for his third shutout of the season and Ryan Johansen scored a short-handed goal as the Nashville Predators defeated the Minnesota Wild 1-0 Monday night. The Wild put heavy pressure on Saros after pulling Dubnyk in the final 2 1/2 minutes. Ryan Donato hit the crossbar with a wrist shot from the left circle with 1:30 to play, and 30 seconds later Saros stood firm as Eric Staal deflected Donato’s centring pass into the crease. Minnesota’s power play came up empty on three opportunities and gave up the game’s only goal as Johansen scored his 12th goal of the season short-handed, just 4:32 into the first period. With Craig Smith in the box for tripping, Viktor Arvidsson led a 3-on-2 Predators rush, dropping the puck for Johansen just over the Minnesota blue line. Johansen skated to the high slot and his wrist shot beat Dubnyk over the left shoulder. Minnesota is 2-7-1 in its last 10 games and 2-8-4 in its last 14 home games. NOTES: Minnesota played its second straight game without F Zach Parise (lower-body injury). … Nashville forward Rem Pitlick made his NHL debut on Monday. He recently finished a three-year career at the University of Minnesota. Pitlick is the son of former Senators and Panthers defenceman Lance Pitlick. … The Predators swept back-to-back games against the Wild in early March, both in shootouts.